This recipe is delicious. It only takes a few minutes to prep, and then you pop it in the oven. With healthy grains, vegetables, and herbs, this is as delicious as it is good for you. I didn’t add cheese to it to keep it dairy-free, but feel free to top it with mozzarella 10 minutes before the peppers are done cooking. 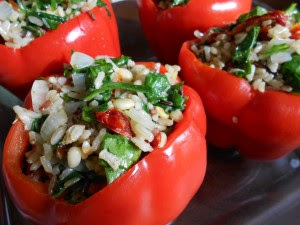 Italian Rice Stuffed Peppers 4 large red bell peppers 1 Tablespoon walnut oil 1 small sweet onion, diced 1/2 cup sun-dried tomatoes, chopped 5 ounces baby spinach, coarsely chopped 1 Tablespoon minced garlic 3 cups cooked wild rice 1 Tablespoon pine nuts, toasted 2 teaspoons Italian herb seasoning 1/4 teaspoon salt 1/4 teaspoon freshly ground pepper 1. Preheat oven to 350 degrees. 2. Remove the tops from the peppers, and take out seeds and ribs from the peppers. Cook the peppers in boiling water for 2 to 3 minutes each, until the peppers are slightly tender. Remove from water and drain upside down on a plate. 3. Heat walnut oil in a large skillet over medium-high heat. Add onion and cook 3 minutes, or until onion is translucent. Add sun-dried tomatoes, spinach, and garlic. Cook until spinach is wilted. Add rice, pine nuts, herbs, salt and pepper. When cooked through, spoon rice mixture into each pepper. Place peppers into a glass baking dish and pour 1/2 inch water into the bottom of the dish. Cover with foil and bake for 30 minutes, or until tender. As a dairy-free vegetarian, I know that a healthy salad has to be hearty and nutrient rich. Many cookbooks skip salads or treat them as little more than side dishes. Salad for Dinner by Tasha DeSerio is the exception. 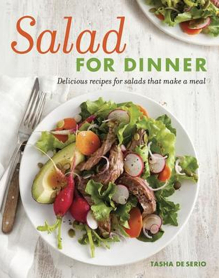 The entire book focuses on delicious salads that are filling and appealing to people of all dietary preferences. With options like “Garden Lettuces with Green Beans, Figs & Hazelnuts” and “Herb Salad with Beets, Oranges & Almonds”, this cookbook has unique options for creative and truly impressive salads. Beyond this, though, DeSerio provides a wealth of cooking advice. With multiple formulas for tasty dressings and vinaigrettes, this book provides the basics for any ambitious salad chefs. DeSerio, however, goes above and beyond and includes information on basic skills for prepping vegetables and creating toppings like pickled beets and rustic croutons. The vegetable and fruit salad chapter features recipes like “Warm Young Artichoke and Potato Salad” and “Shaved Brussels Sprouts with Celery, Pomegranate & Toasted Walnuts” while the Grain, Bread & Pasta Salad chapter features “Rice Salad with Asparagus, Favas & Peas” and “Quinoa, Red Pepper & Cucumber Salad with Avocado and Lime”. Although this book is all about salads, it is not a vegetarian or vegan cookbook – many recipes feature ingredients like cheese, pancetta or crab. The stories behind the salads are intriguing and the pictures are truly tantalizing. With dozens of unique salad recipes, eating your veggies will never be boring – Salad for Dinner is a truly revolutionary cookbook! Last year, my husband and I took a tour of the south, ending up in New Orleans where we experienced a completely different cuisine. One of my husband’s favorite meals was the New Orleans classic muffaletta sandwich. While the original version is loaded with deli meats and cheeses, this version is completely vegan. If you are looking to make things easier, there is a muffaletta mix that is pre-made by Granzella’s – it is delicious, but the homemade version is even better if you have the time. 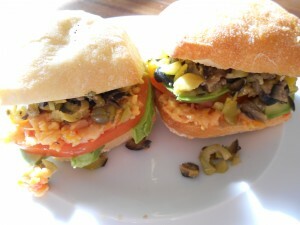 Vegan Mediterranean Muffaletta Sandwich 1 (15 ounce) can garbanzo beans, rinsed and drained 1/2 cup jarred roasted bell peppers, sliced 1 cup pimiento-stuffed green olives 1 cup pitted black olives 1/2 cup seeded peperoncini 1/2 dill pickle, finely diced 2 Tablespoons garlic, minced 2 Tablespoons capers, drained 1 teaspoon dried oregano 1/4 cup olive oil 2 Tablespoons white wine vinegar 6 small ciabatta rolls, halved lengthwise 1 large avocado, thinly sliced 1 large heirloom tomato, thinly sliced 1. Add garbanzo beans and roasted peppers to the food processor and pulse about 6 times, or until coarsely chopped. This should not be pureed, so don’t over-pulse. Remove from food processor and spoon mixture into a small bowl. 2. Wipe food processor out, and add olives and peperoncini. Pulse about 6 times, or until coarsely chopped. Spoon mixture into a medium bowl and add pickle, garlic, capers, and oregano. Mix gently, then drizzle olive oil and white vinegar over it, tossing ingredients to coat. 3. In a 350 degree oven, heat bread, just to warm. To assemble sandwiches, spread garbanzo bean-pepper mix on the bottom half of the bread. Top with tomato slices and avocado slices. Finish with olive mix and top with the other half of the roll. In Italian, this translates to “Prostitute’s Stew”, but you don’t have to be a woman of ill-repute to appreciate this easy and delicious stew. It is great on its own, and also wonderful the next day, served atop some crusty bread that has been warmed in an oven. 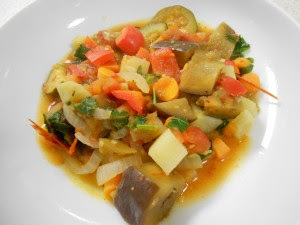 Puttenaio 1 Tablespoon olive oil 1 large eggplant, cut into 1-inch chunks 1 large potato, peeled and cut into 1-inch chunks 1 cup carrots, peeled and diced 3 stalks celery, diced 1 large zucchini, cut in half lengthwise and thinly sliced 1 large red bell pepper, cored and chopped 1 medium onion, cut in half and thinly sliced 1 Tablespoon crushed garlic 1/2 cup low-sodium vegetable broth 3 cups fresh tomatoes, thinly sliced 1/2 cup fresh basil Salt and pepper 1. Heat olive oil in a large pot over medium-high heat. Add vegetables, cooking for about 5 minutes, stirring as necessary. Add vegetable broth and tomatoes, mixing thoroughly. Add 1/2 teaspoon salt and 1/4 teaspoon pepper to pot. Bring to a boil, then reduce heat and simmer, covered, for 40 minutes. 2. Add fresh basil and stir to incorporate. Cook over medium-low for 10 more minutes, then serve. This book may have one of the longest titles I’ve seen in a long time, but Grammar Girl has done it again with 101 Troublesome Words You’ll Master in No Time! While I am an English teacher and this might just be my inner nerd speaking, I love how easy this book makes it to learn proper grammar – perfect for my classroom and my own personal knowledge. With words that are commonly confused and easily misused, this guide by Mignon Fogarty is ideal for everyone who wants to effectively communicate their message and sound intelligent and appropriate. With entries for words ranging from alright/all right to have got and I’d've to myriad, this covers all the basics and many more. Each entry provides the etymology (word origin) of the specific phrase and gives a brief history of how it has evolved over time and come into favor (or fallen from grace) and is broken down easily into the categories “What’s the Trouble?” and “What Should You Do?”. Furthermore, each word is used in a quote from a contemporary film, t.v. show, or article in order to show the best and most appropriate use. This book goes into great detail on appropriate usage of a wide variety of words including whom, smokey, and plethora as well as a number of phrases that are tricky as well. While I highly recommend this book, it is truly only appropriate for speakers of American English as there are a number of colloquialisms, idioms, and spelling differences that would not make sense for natives of other English speaking nations such as Canada or England. 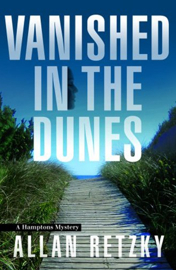 Vanished in the Dunes is a terrific summer read – completely engaging and keeps you guessing until the very end. Allan Retzky has crafted a story that is filled with suspense and unexpected twists, even up to the last page. The story begins when Amos Posner, a New Yorker who has been accused of financial impropriety and forced to leave his lucrative job, heads out to the Hamptons to escape the stresses of the city and a troubled marriage with his wife, Sara. While taking the bus to his Hamptons cottage, Posner encounters Heidi, a stunning dark-haired beauty; Heidi’s flirtatious nature and insistence on talking to Amos don’t end after the bus has arrived in Amagansett. Heidi sees him again at a local store and begs for a tour of town, even going so far as to ask to see Amos’ home. Although he is reluctant to invite her in, Posner does show her the view from his home and Heidi quickly makes herself comfortable, even choosing to stay when Amos must return to town to get his wallet which he forgot at the store. Upon his return, however, Posner is shocked to find his front door open and Heidi’s lifeless body in his foyer. While he had nothing to do with her death, Amos immediately feels that he will be suspected by the police as well as his wife who has already suggested infidelity. Acting rashly, Amos buries Heidi on a local shoreline and so begins a story filled with suspense. Posner is suspected by police because he is one of two locals who was seen talking to Heidi, but her med school student boyfriend, Stern, quickly becomes the target of the police investigation. He has no alibi and seemed infatuated with Heidi despite his insecurity in their relationship. Stern quickly falls into depression and a downward spiral induced by psychological troubles and an obsession to find out what truly happened to Heidi, going so far as to stalk Posner. The tension mounts as Posner fears being discovered and having to face the law and his wife, and Stern becomes a viable threat in his pursuit of justice. The end is truly unexpected – I won’t even begin to comment on it because I don’t want to give anything away – it is really a pleasure to read. Heidi’s estranged sister, who has a remarkable resemblance to Heidi, comes to Amagansett to help, but seems fairly detached; this may be the one unbelievable aspect of this book – no one from Heidi’s family seems to care about her disappearance and even though the sister came to resolve the issue, there is little emotion, even when it would be appropriate or expected. Overall, this is a great story and a thoroughly enjoyable read. It is just fluffy enough to take to the beach, but is filled with unexpected twists and turns that will keep you guessing until the end.